To punch the head of he. There was a London publisher in the late 1800s by the name of Elliot Stock (1838-1911) who made a name for himself, surely not as a poet, but as a publisher of books and magazines for the book collector. Elliot Stock believed he knew exactly what book collectors wanted because he was a book collector himself. 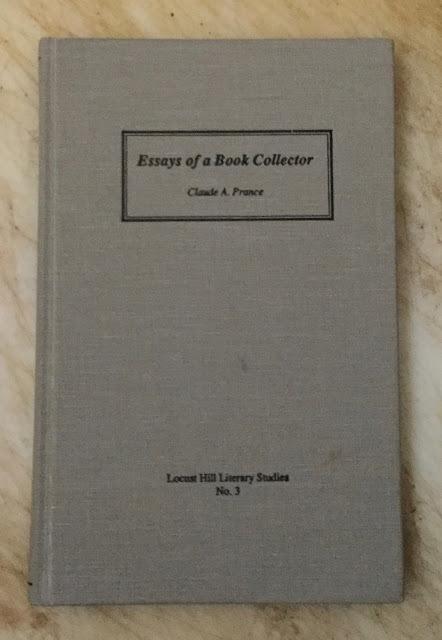 And he published facsimiles of famous first editions, magazines of book lore, and more than a handful of series of books on bookish topics for the book collector to enjoy. Of all the series of books Elliot Stock published, the most popular series was The Book Lover's Library. The first book in the series was published in 1886, and the last in 1902, both of them written by Henry B. Wheatley. 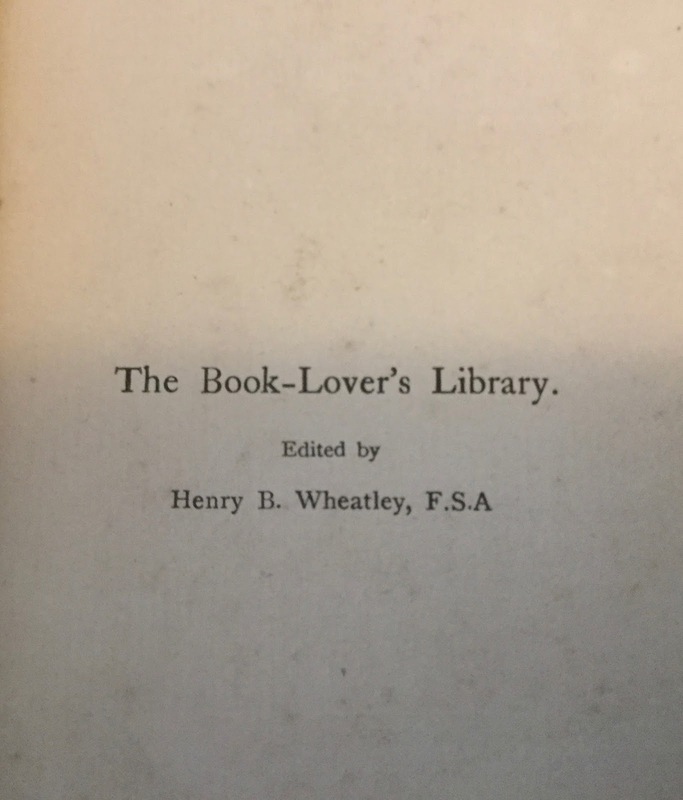 As editor and contributor, Henry B. Wheatley (1838-1917) was the heart and soul of The Book Lover's Library series. A book collector himself, he was Elliot Stock's editor for The Bibliographer, the author of books about the diaries of Samuel Pepys and John Evelyn, and the author of a book titled, What is an Index? Most importantly, however, were Henry B. Wheatley's connections in the book world. And he used these connections to line up authors for The Book Lover's Library series. Henry B. Wheatley was a fellow in the Society of Arts, the founder of the Index Society, a co-founder of the Topographical Society of London, a member of the Sette of Odd Volumes (later President), the Early English Text Society, and the New Shakespeare Society. 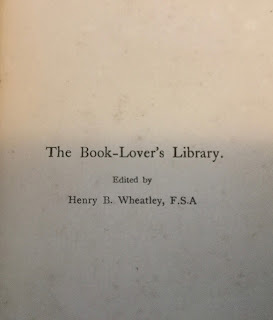 As The Book Lover's Library series was being published from 1886 to 1902, Wheatley joined the Johnson Club, founded the Samuel Pepys Club, and became Vice President, then President of the Bibliographical Society. A more qualified person to be editor of The Book Lover's Library would have been hard to find. 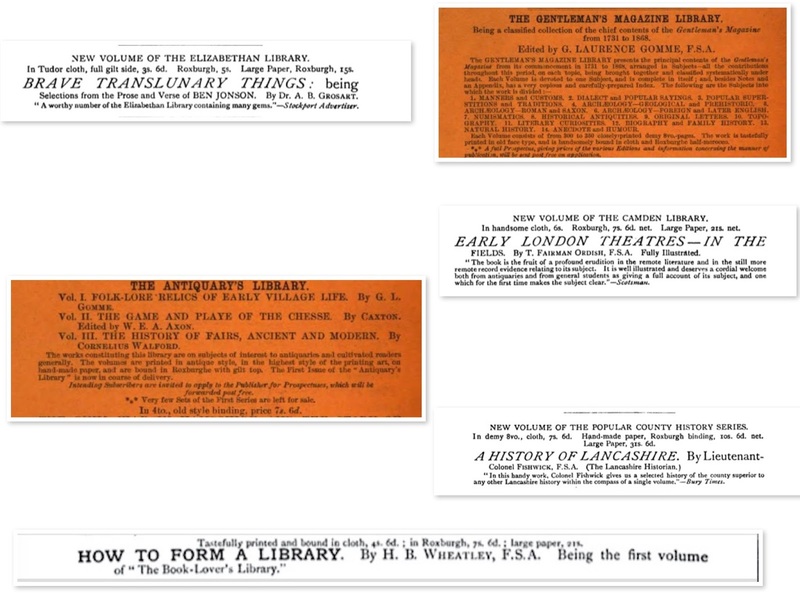 Not all the volumes identified in these announcements were published in The Book Lover's Library seres. 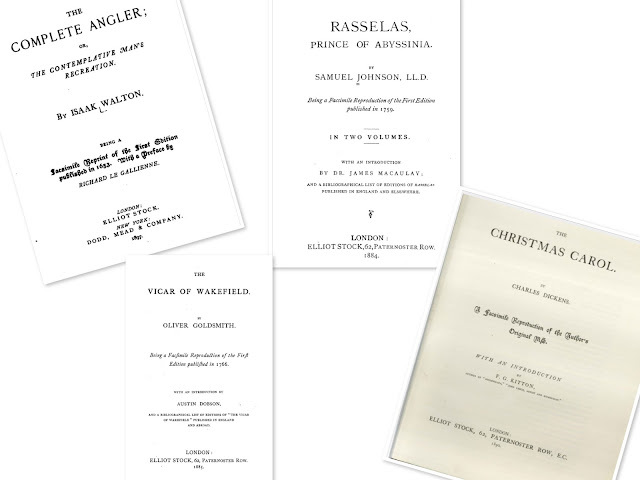 And more volumes were subsequently added to the series. But I do find it interesting to see which books "might have been" part of The Book Lover's Library. A closer look at this list of books in preparation highlights the benefit of Henry B. Wheatley being the editor of this series. Two of the authors of the books in preparation were co-founders, along with Wheatley, of the Topographical Society of London: H. Trueman Wood and G. L. Gomme. 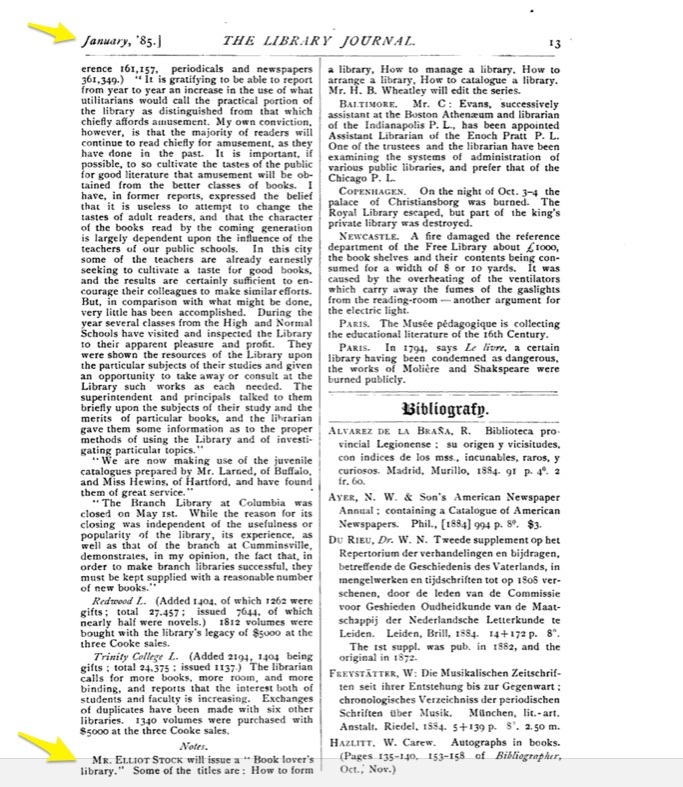 And a third author, T. F. Ordish, became Honorary Secretary of the Topographical Society after its first meeting. Another author of a book in preparation was George Clulow. On March 2, 1884, Clulow gave a presentation on Playing Cards before the Sette of Odd Volumes, displaying 55 playing cards from 1480 to the present. 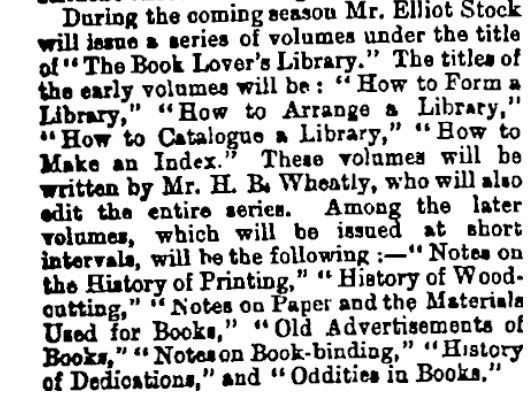 If Henry B. Wheatley was already a member of the Sette of Odd Volumes in 1884, he may have attended this meeting, and signed Clulow up as an author for The Book Lover's Library series. 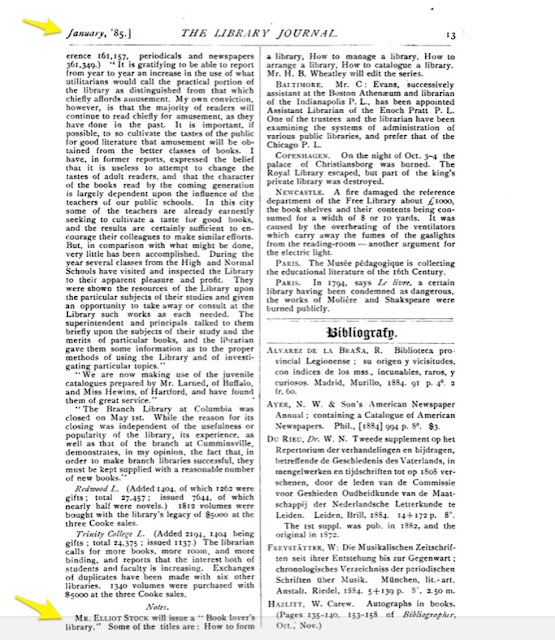 As Assistant Secretary of the Society of Arts, however, Wheatley surely was in attendance on May 8, 1889 when Clulow read a paper before the Society of Arts on The Origin and Manufacture of Playing Cards. But Wheatley may have determined that The History of Playing Cards would be too short for publication in The Book Lover's Library series (Most books in the Book Lover's Library series were between 150 and 300 pages long). On a side note, the Chiswick Press published The Origin and Manufacture of Playing Cards in 1889, and it was 40 pages long. How to Arrange a Library by Henry B. Wheatley was another book in preparation that never made it to the printer. Terry Belanger's 1985 book, Lunacy and the Arrangement of Books, was only 26 pages. I doubt if Wheatley could have stretched his book to 150 pages. 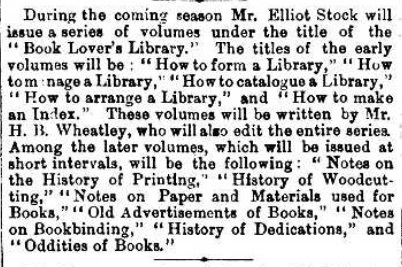 The same might be said for How to Manage a Library, also by Wheatley, which was dropped prior to the Nov. 6, 1885 announcement in The Bookseller. 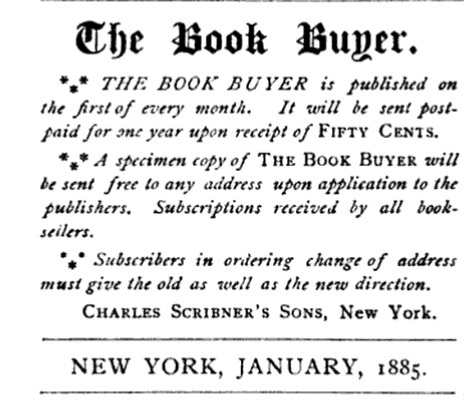 A third book listed as "in preparation," Notes on Paper Materials Used for Books, by T. F. Ordish was not published in The Book Lover's Library series either. 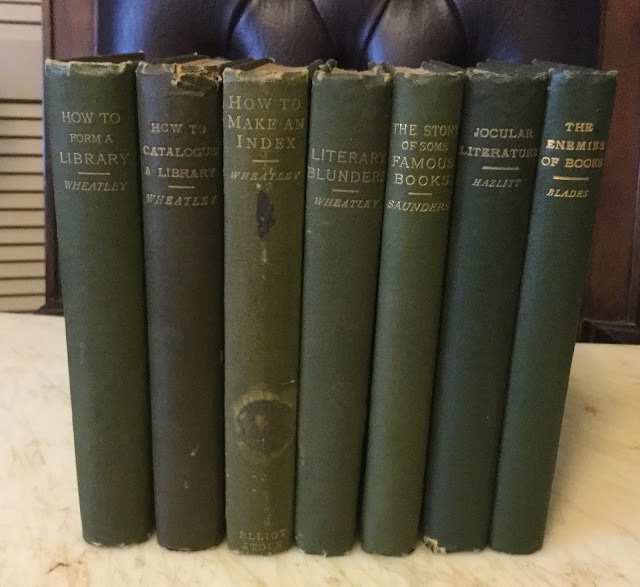 I believe, however, that Elliot Stock decided to include this topic in a volume of The Gentleman's Library series edited by G. L. Gomme: Literary Curiosities and Notes by A. B. G. (A. B. Grosart) which was published in 1888. This volume also included another topic originally destined for The Book Lover's Library series: and mentioned way back when in The Evening News in Nov 1884: Notes on Bookbinding. Where Elliot Stock published Old Advertisements in Books–if he published it at all–I have no idea. Prance's article is included in his book, Essays of a Book Collector: Reminiscences on Some Old Books and Their Authors, published by Locust Hill Press, West Cornwall, Ct. in 1989 (moi recommends). All told, Elliot Stock published 26 volumes in The Book Lover's Library series. 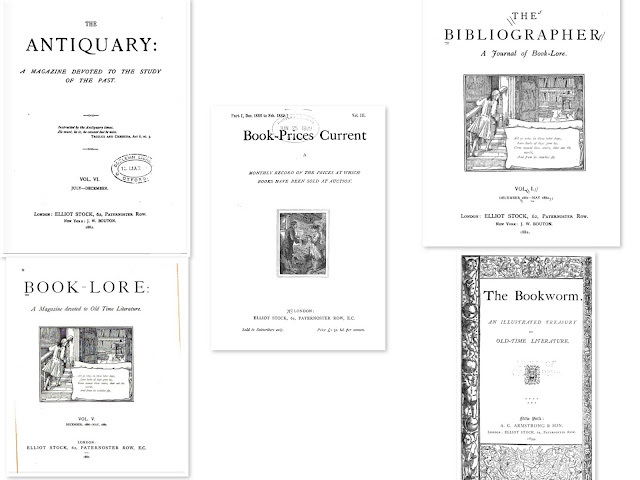 And Prance describes the contents of each volume in his article. Printed on antique paper, rough paper edges in green cloth with bevelled edges. All but one of my volumes of The Book Lover's Library series are in green cloth with bevelled edges. Elliot Stock used this same binding for books by Augustine Birrell and J. Roger Rees. I have two 1902 reprints of The Enemies of Books, and with different "popular bindings." 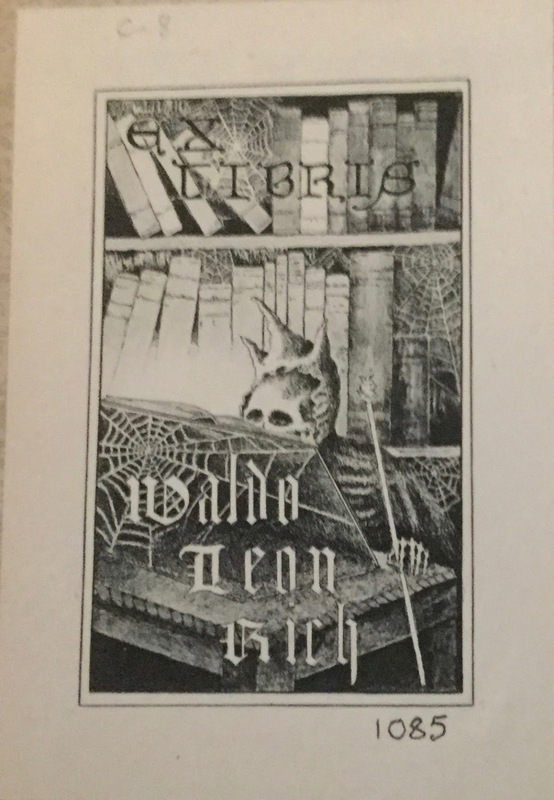 Most curiously though, the 1902 edition only contains one illustration, whereas the 1888 edition contained eight illustrations. Nothing else was revised. I also have a 1968 Gale reprint of the 1892 edition of Books in Chains by William Blades. I will eventually trade up for a Book Lover's Library edition. There are a few more Book Lover's Library volumes I will add to my library before I get old and grey . But not the whole series. Some volumes, like the Dickens volumes, just don't appeal to me. My Australian friend, John Byrne, has all 26 volumes in the green beveled cloth, and a few large paper editions to boot! 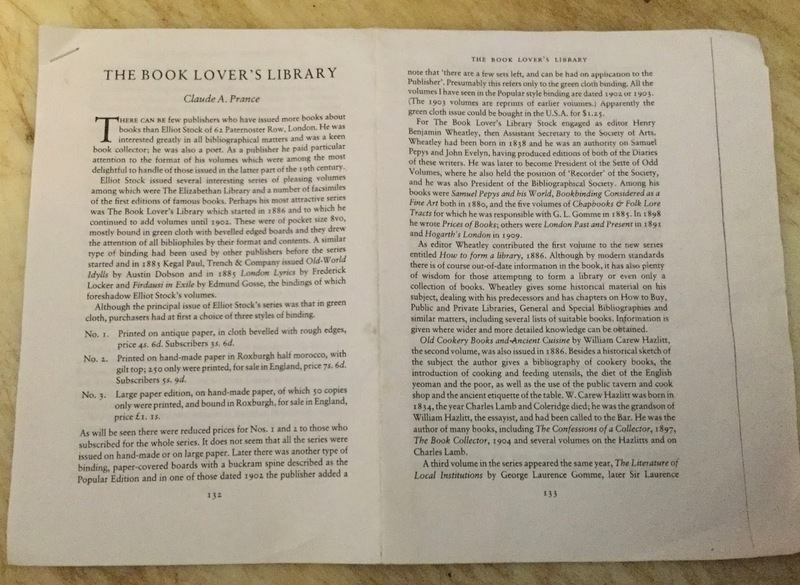 Another Australian, Patrick Spedding, wrote a blog post about The Book Lover's Library in February 2015. My favorites in The Book Lover's Library series are these three books. Although the information contained in the volumes is outdated, the books provide a vivid picture of how book collecting, library cataloguing, and indexing was in the time of Elliot Stock and Henry B. Wheatley. 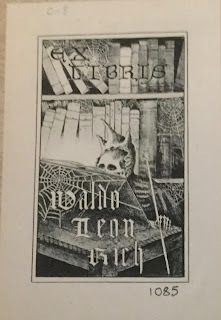 My copy of How to Catalogue a Library was formerly owned by the Rubaiyat Collector, Waldo Leon Rich. I wonder if he referred to Wheatley's book to catalogue his collection? 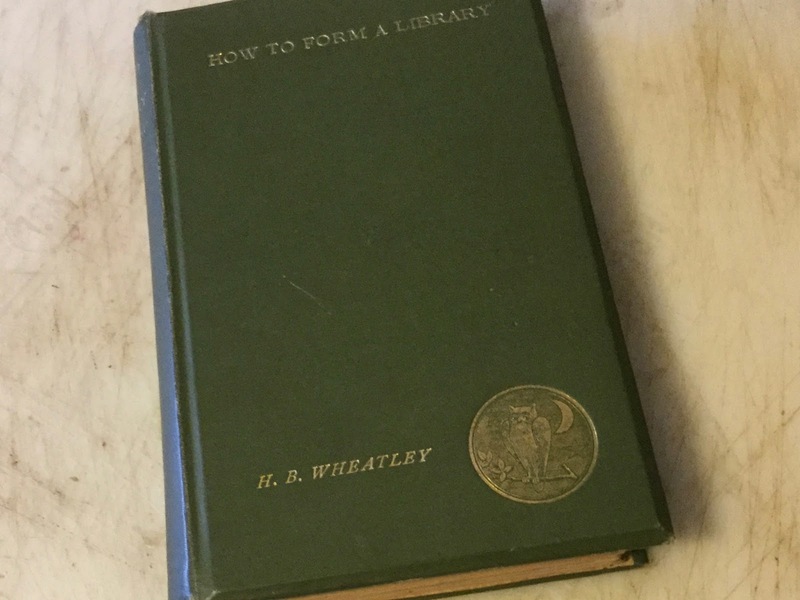 How to Form a Library by Henry Wheatley, 1886. Old Cookery Books by William Carew Hazlitt, 1886. The Literature of Local Institutions by G. Laurence Gomme, 1886. Modern Methods of Illustrating Books by H. T. Wood, 1887. The Dedication of Books to Patron and Friend by Henry B. Wheatley, 1887. Gleanings in Old Garden Literature by William Carew Hazlitt,1887. The Story of Some Famous Books by Frederick Saunders, 1887. The Book of Noodles: Stories of Simpletons; or Fools and Their Follies by W. A. Clouston, 1888. The Enemies of Books by William Blades, 1888. Foreign Visitors in England, and What They Thought of Us: Being Some Notes on Their Books and Their Opinions During the Last Three Centuries by Edward Smith, 1890. 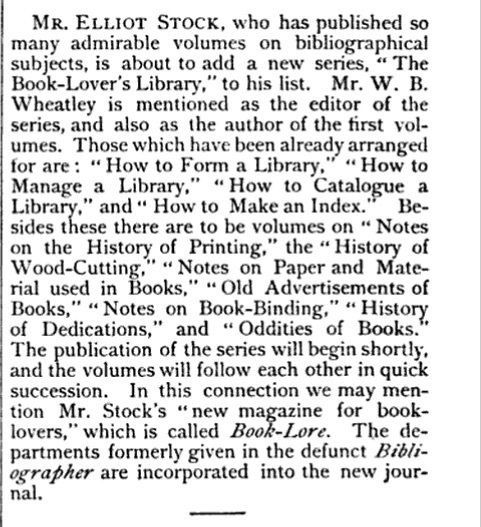 How to Catalogue a Library by Henry B. Wheatley, 1889. Studies in Jocular Literature: A Popular Subject More Closely Considered by W. Carew Hazlitt, 1890. Newspaper Reporting in Olden Time and Today by John Pendleton, 1890. The Story of the 'Imitatio Christi' by Leonard A. Wheatley, 1891. Books Condemned to be Burnt by James Anson Farrer, 1892. Books in Chains and Other Bibliographical Papers by William Blades, 1892. Literary Blunders: A Chapter in the History of Human Error' by Henry B. Wheatley, 1893. Book Song: An Anthology of Poems of Books and Bookmen From Modern Authors by Gleeson White, 1893. Walton and Some Earlier Writers on Fish and Fishing by R. B. Marston, 1894. Books Fatal to Their Authors by P. H. Ditchfield, 1895. Book-Verse: An Anthology of Poems of Books and Book-men From the Earliest Times to Recent Years by W. Roberts, 1896. The Literature of Music by James E. Mathew, 1896. The Novels of Charles Dickens: A Bibliography and Sketch by Frederic C. Kitton, 1897. Book Auctions in England in the Seventeenth Century 1676-1700: With a Chronological List of the Book Auctions of the Period by John Lawler, 1898. The Minor Writings of Charles Dickens: A Bibliography and Sketch by Frederic C. Kitton, 1900. 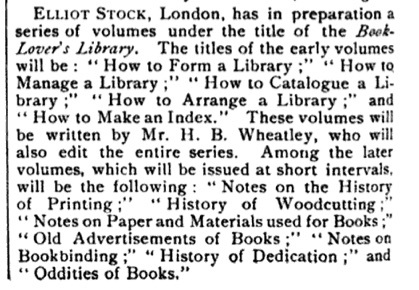 How to Make an Index by Henry B. Wheatley, 1902. Thank you for sharing another enlightening article about books; I look forward to them. I'm curious about something: was Wheatley a co-founder of the "Topographical" Society, or did a typo make that from "Typographical"? Either might be possible, so I seek clarification. I have a copy of the "Literary Blunders" volume text-block, with deckle edges and gilt top, which I bought uncased; I enjoy the humor in my "paperback" Wheatley. Thank you for the very interesting article on the BLL in general and Henry Wheatley in particular. I found it very informative and helpful. I am not a collector of BLL at present, though I will likely do so moving forward. I do own two BLL editions, a large paper copy of The Imitation and a what I thought of as 1/4 buckram binding of Literary Blunders. I bought the first ten years ago because I collect books about books, and the second because I was interested in Wheatley himself. I found them both good reads. I do have a question. The Imitation's author is noted as Leonard A Wheatley. Any idea who this might be. I thought it was likely a son or son-in-law of Wheatley, he had five children. Given some of the information in the blog you wrote, and the introduction to the Imitation, the original editor of the book was not noted as Wheatley, but another, who passed away. It makes sense if Henry Wheatley gave the project token. There is no other mention of Leonard otherwise. I appreciate the link to the other Wheatley BLL blog as well. The more information the better. Thanks for your kind words about my article on the Book Lover's Library series. In answer to your query, I don't think Leonard Abercrombie Wheatley was related to Henry B. Wheatley. If he were, I believe it would have been mentioned on Leonard's obituary that was published in the periodical, The Academy, in 1895. Leonard was a bookseller, an author, and a contributor to several contemporary magazine (http://tinyurl.com/n7oojq4). Henry B. Wheatley did have an older brother but his name was Benjamin Robert Wheatley. I am reading diaries handwritten (1876-1905) where the author is excited that Elliot Stock has agreed to publish his book. Unfortunately, the diary ends with the death of this man and one never discovers if the book is published (I assume not). My question: how would one find the record of manuscripts read in 1905 by the Elliot Stock 'readers'? I know this is a long shot. I'd be surprised if there was a record kept of manuscripts read in 1905 by the publishing house of Elliot Stock. The author did say that Elliot Stock agreed to publish ihs book, so your best bet would be to search the author's name, and see you can find a book by him that was published by Elliot Stock in 1905 or 1906.